STORM - Scientific Training on Reptile Management. A pioneering initiative by the KÄlinga Centre for Rainforest Ecology is aimed at all those people who have taken the leap from abhorring reptiles to understanding and learning to co-exist with them. Be it novice snake rescuers, students, enthusiasts who would like to hone their knowledge or others who want to learn right and ethical methods of handling them, this comprehensive tri-series workshop is an open door to learning about reptiles. ‘Snake wrangling’ has assumed a glamorized stead that leaves behind realities and ethics. And with more people wanting to try their hand at it, they not only risk their own lives but endanger the lives of snakes they are supposedly ‘rescuing’. Through this workshop we aim to train enthusiasts on scientific methods and techniques in snake rescue. If you are among those who are eagerly waiting to get up close with snakes, be part of snake rescue, curious enough to look beyond myths to learn fascinating facts, and are keen to educate yourself about the life of serpents then this workshop is for you! Anybody over 18 yrs of age, who has a keen interest and passion to learn about snakes, snake rescuers who would like to hone their skills, those who are considering herpetology as a career choice, and those who want to get over their fear of snakes. Identifying relocation sites and Snake release. Who is conducting the workshop? Gowri Shankar has been involved with reptiles for more than a decade and has worked at some of the premier reptile conservation centers in India. He honed his skills in captive management of snakes at the Madras Crocodile Bank Trust/ Center for herpetology and has also authored several peer reviewed papers. He has been studying king cobras in the wild for the last six years. He is an authority on the ecology of king cobras and has been featured in several wildlife documentaries the ‘King and I’, ‘Secrets of the King Cobra ‘, ‘Asia’s Deadliest Snake’, and ‘Wildest India’ by BBC, National Geographic Channel, Nat Geo Wild and Discovery Channel respectively. ‘Snake Shyam’ , originally M.S. 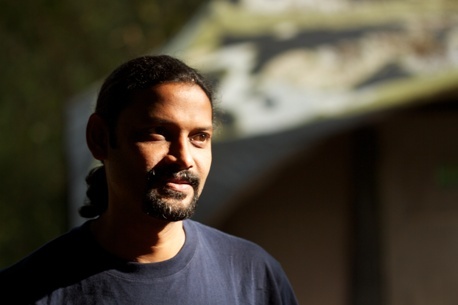 Balasubramaniam, is an integral part of Mysore’s herpetological scene. He has been rescuing snakes since 1982 with an undeterred passion and deep concern for these ophidians. With over 25,200 snakes recorded in his log book, his data and experience is a precious treasure. He now has a terrarium to keep snakes till before their release every weekend. He was featured in ‘Croc Chronicles: Snakes, Karma, Action ‘ on National Geographic and also has a street named after him. His flamboyant attire and his humility is a win among younG and old alike. "Water, air, soil, fire and life we are all linked! The Agumbe rainforests of the Western Ghats is a precious gift of life to South India. A biodiversity hot spot, it holds within its folds a world of new science yet to be explored. As Tiger is for mainland the flagship of the reptilian world in these forests is undoubtedly the King Cobra(Opiophagus hannah), colloquially known as KÄlinga! Our focus at the KÄlinga Centre for Rainforest Ecology is to open doors of opportunity to people from varied backgrounds to learn scientific tools of conservation through workshops and camps. We aim to empower different target groups with right knowledge"
You are invited to attend STORM - Scientific Training on Reptile Management.